Guestrooms at Hotel Fort Rajwada Offers minibars and coffee/tea makers. Guestrooms offer complimentary newspapers and safes. Rooms also include trouser presses and irons/ironing boards. Guests may request wake-up calls. Fort Rajwada Hotel include a restaurant and a coffee shop/caf�. A bar/lounge is open for drinks. Room service is available 24 hours a day. Recreational amenities include a children's pool, outdoor swimming pool, a health club, and a steam room. Spa amenities include massage/treatment rooms, facials, body treatments, and beauty services. Fort Rajwada 4-star property has a business center and offers audiovisual equipment. Guest parking is complimentary. Additional property amenities include a concierge desk, an arcade/game room, and currency exchange. 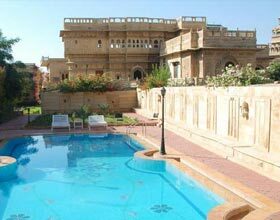 Fort Rajwada hotel Jaisalmer within walking distance of Bhatia Market and Nathmalji-ki-Haveli. 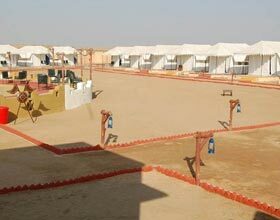 Additional points of interest include Jaisalmer Fort and Patwon-ki-Haveli.